Self-published online using YuDu Publishing and available for free download at this website. 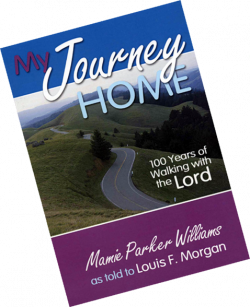 My Journey Home: 100 Years of Walking with the Lord is the story of 100-year-old Mamie Parker Williams as told to Louis F. Morgan. Originally published in 2004, this revised edition is available online for free download. It contains a new cover, layout format, and interactive audio and video clips. It traces the century long journey of Mamie Parker Williams from her childhood in Calhoun County, Missisisppi, marriage and ministry travels with Reverend Grant Williams, joys of motherhood, and retirement and final years in Morgantown, Mississippi. Click here to access the free version of the publication online! Co-authored with David G. Roebuck, Ph.D.
• Biblical Stewardship of Records and Resources. A timeline at the bottom of each page traces notable events along with pictures. The magazine will take you on an inspiring journey of the growth of the Church of God, and this insightful and valuable souvenir has been made available free of charge online. 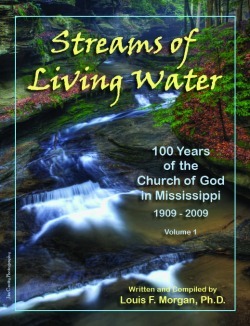 To commemorate the 100th anniversary of the introduction of the Church of God into Mississippi, I self-published an e-book tracing the history of the Church of God in Mississippi. This first volume highlights the missional focus of those early pioneers during the formation and development of the Church of God in Mississippi from 1909 through the mid-1940s. It examines briefly the diverse movements within Pentecostalism impacting the Church of God in Mississippi, followed by reflections of how the movement spread throughout the state prior to 1945. The story culminates with accounts of men and women from various locations who proclaimed the message of Jesus Christ and the full gospel in their local communities. This history is a culmination of more than 20 years of personal research and interviews, and it was published free-of-charge as my gift to the people of Mississippi. I trust you will be inspired and informed when reading about God's faithfulness to Church of God members in Mississippi. The story of Mamie Parker Williams is the history of the Church of God in one life. Reading it will inspire a new appreciation for the sacrifices of the church's pioneers and a new respect for its elders. You will smile and laugh and sigh and weep as you make your way through these pages. What a story! What a lady! Thanks, Louis Morgan, for introducing her to this generation! Sister Mamie Williams, who celebrates her 103rd birthday this year, has been a church mother to many hundreds of people, including my wife Geri and me! Sister Mamie and her late husband, the Reverend G.G. Williams, had a special talent for loving and helping young preachers get started in the ministry. Their influence continues to live throughout the world. Mamie Williams has faithfully served God and the Church of God whenever and wherever He had called and directed. And along the way she has lived through and participated in much of the history of the Church of God. With the skillful assistance of Louis Morgan, My Journey Home will inspire readers to faithfully complete their own journeys with the Lord. These pages portray the life of an exemplary saint, Mamie Williams. As her pastor, I know firsthand about her passion for Christ and her compassion for others. This story is sure to inspire and encourage you. Memories of Moma tells the inspiring story of a remarkable woman of God, Clara Allison Priest. Her story is a testimony of God's grace and guidance in the lives of the pioneers of the Pentecostal Movement in Mississippi. I recommend this book as a valuable insight into the common heritage of the Church of God and Church of God of Prophecy. My friend, Louis Morgan, knows how important it is to study history. He knows that we gain valuable insight into the character of God when we look at how he dealt with people in the past. I pray this book will instill passion to know God in all who read it. As a teenager living in Magnolia, Mississippi, I came under the influence of Bishop J.T. and Evangelist Clara Priest, whose commitment to the work of the Lord is unparalleled with contemporaries of their day. Only heaven will reveal all accomplished in advancing the kingdom of God! There is value in looking to the historical accounts of great women who have lived in difficult days and left a legacy of faith. 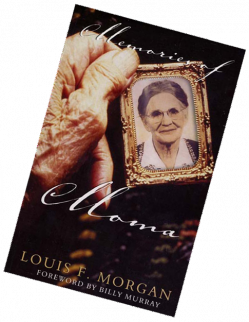 Louis Morgan has brought to life the memories of his great-great grandmother who lived and ministered in the early to mid-1900s. It is hoped that her stories will provide moments of courage and a fresh point of view through the eyes of her faith.